There's nothing pretty about a plain mattress pushed against a wall, no matter how fancy your spread or duvet. A bed or headboard gives your bedroom a decorated, finished look. If a new bed isn't in your budget at the moment, make your own headboard from a flea market or yard sale find. You can use old doors, vintage rugs, or even a salvaged fireplace mantel. When you think about it, table lamps are just decorative objects that fit on a table, hold a shade, and have the wiring and socket for a light bulb. Many store-bought lamps with hefty price tags are just reproductions of antique and vintage objects. Save money -- and enjoy owning something original -- by making your own table lamps from flea market finds. Mason, Bell, and Ball are some of the most famous brands of canning jars, and you can find them for sale at most flea markets. Old canning jars look charming in a cottage or rustic home, and they're good for far more than holding food. You can turn them into bathroom or craft storeage, or even transform them into chandeliers. 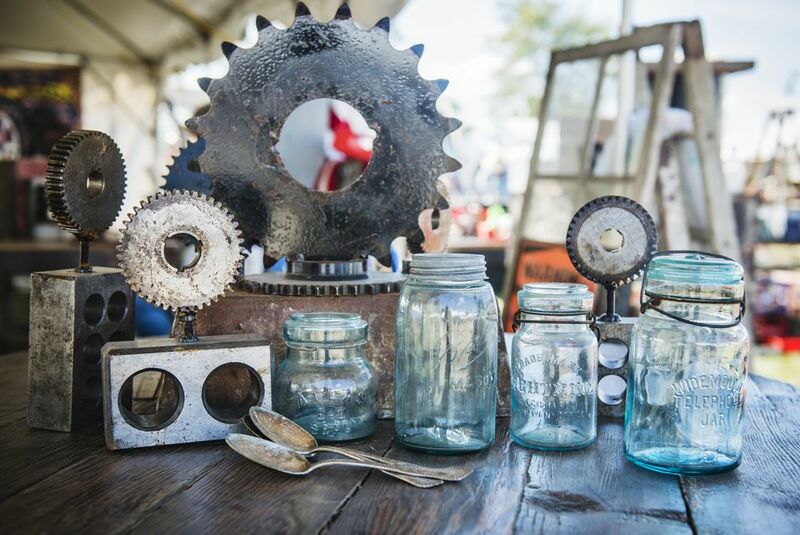 Flea market finds worthy of repurposing aren't limited to furniture, architectural salvage, and other hard-edged objects. You can repurpose textiles too, and vintage drapery panels are among the easiest to find. You can use them as an upholstery material, or stitch them into new soft goods for your home, such as pillows or shower curtains. Skip the plastic containers and turn flea market finds into decorative storage you don't have to hide. You can use everything from steamer trunks to painted tins to discarded commercial display units. It all depends on what you find and what you need to store. If you're short on cabinet space in your kitchen, turn a flea market find into pot racks. To make a pot rack, you just need a sturdy piece you can hang from the ceiling or mount on the wall, and it needs some sort of bars or a grid to hold S-hooks. Good candidates include iron gates, old wooden windows, and ladders. If you have more books than bookcases but you'd rather spend your extra cash buying books, turn a flea market find into a DIY bookcase. You can make bookcases from shipping crates, old tables, or a freestanding ladder and some boards. The right option for you depends on your decorating style and the number of books you need to shelve. Old windows -- particularly those with arches or divided glass panes -- are far too charming to end up in landfills. When you find an old window, turn it into home or garden decor. You can use old windows to make a room divider, a table, a message board, or a flower box. You can even build a greenhouse for your yard.